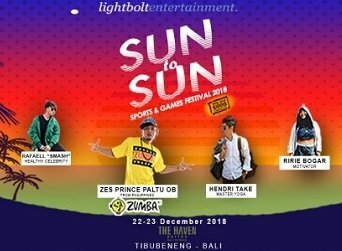 "SUNtoSUN" SPORTS & GAMES FESTIVAL 2018 is a new idea of sports, games and traditional acts collaborated in one day, from SUNrise to SUNset! Yet We still have the Color Run on the second day! The needs of a healthy lifestyle and positive vibes became larger by day, so "SUNtoSUN" give you what you needs.